As requested by a friend.. yes if you're on Barr report it's identical post. Was requested to put on here. This is one of two diy projects I'm involved in right now. The other is a very involved rebuild of a 35g tank, with handmade background, diy co2 reactor, going rimless, the works. That's gotta be another thread tho. This is not a brief post. Please don't read it and complain it's long. Youve been warned. Yes. Essay. If its not your thing, this isn't the thread for you. It's a journal thread about my tissue culture startup, Adirondack Aquascaping. Being launched from a 2bdrm apartment using half of my 401k. So I've been asked by ppl on discord, Facebook, and other forums to do some kind of journal about what I've done/am doing. There are no promises I will update it super often. I will not, however abandon the thread. What's discussed here... Is currently effectively a second full time job. I work 3 to 4 12h days in semiconductor fab, am in a raid guild in Warcraft (say what you will, it's fun), and have a marriage to actually maintain a through those and this startup. So a blog being updated day by day... Eh. Not #1. But I will come with updates and pictures and converse in comments and such as frequently as I can. At least a few times a week, and on my days that I'm off work and only working in lab, I'll make time before I get on for raid in wow to respond to anything in comments that I can if people have engaged me. Maybe nobody will read it and nobody really cares. Who knows. But I'll check and add to it as often as I can. So the good stuff... The 'journal' for the journal thread. About a month and a half ago I went to a workshop at my favorite LFS. Cost $25 to go, got a $25 gift card for store, so a free day to learn about plants from some company Id never heard of before, but that promises to talk about aquascaping and plants. (That company? Dennerle, hah). Prior to this day, I'd kept only one tank with many plants in it. Low tech 35g with a planted+24/7. Had some easy stuff in my 10g quarantine. Moss balls and feathery plants with my wife's betta. Nothing major, but I wanted to learn more so I went. As he talked about their company, that had flown him here to USA to talk to us, in a small store in upstate NY.... I was blown away. First thing that came to mind was "hey I should ask him if they're going to be branching operations out to USA, I could apply to work in their labs....". Then I thought 'why?'. I went to school for plant biotechnology. 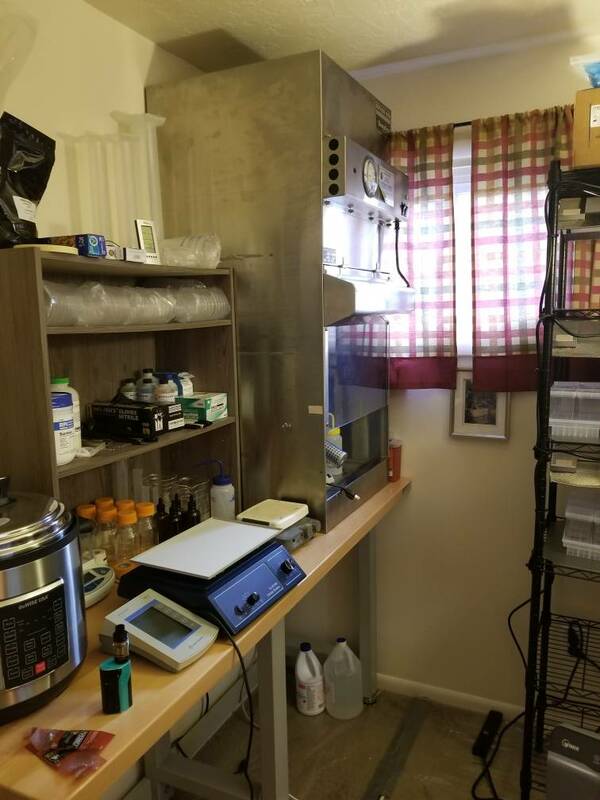 I had some lab equipment at home that I'd slowly been accumulating to have a tissue culture and biohackerish style lab when we got a bigger apartment. Why.... Why not do it myself. So I came home a) with a ton of plants and stuff for my 35g that I decided to get wayyyy super involved in a massive project on, which is another thread entirely, and b) resolved to figure out how to make it happen. I looked into bank loans for the 8 to 10k I'd need to finish setting up. (*Note- I am not saying a TC lab only costs 8k to set up. 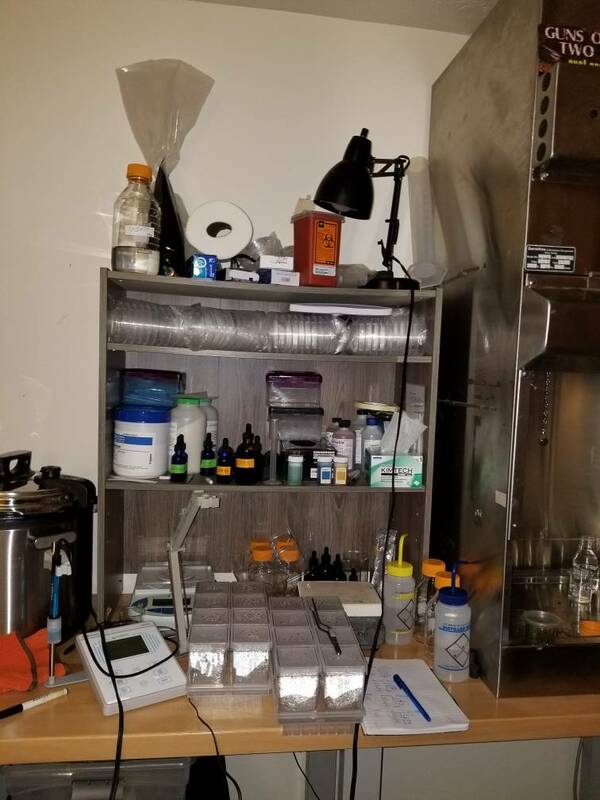 I had some of the major capital equipment already that I had driven sometimes many hours to pick up from auctions I won over the last 2yrs, things like a ~$20k water distillation rig with auto collection jug, ~$3.5k sterile work cabinet, items I paid a fraction of retail price for but had pieced together over a bit of time). I was not about to pay that kinda interest, and make payments out OF my loan since I didn't have the extra out of my normal paycheck to cover what amounted to almost as much as my car payment for short term personal loan, unsecured. Debated on crowd funding. Eh. Beggars. Nope. Cache out Roth? Yep. Let's do it. Then I found out I can borrow half my 401k and pay interest to myself, rather than a bank. So I did that instead. And dumped almost all my penny stocks (that'd actually been doing pretty well, up almost 30% in last 6 months, so I was happy). Finished buying equipment and materials. 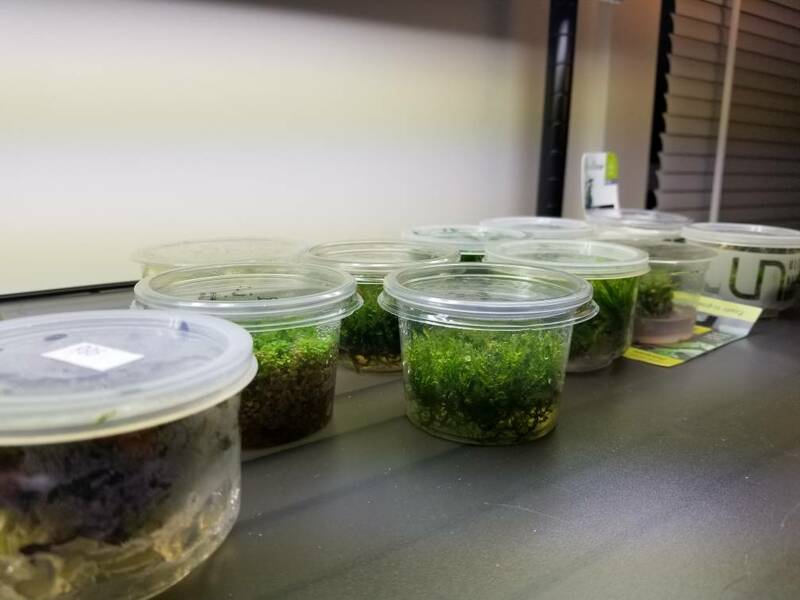 Cases of growing containers, culture rack and lighting, pipette tips and Petri dishes, agar and plant growth regulators... You name it. I suddenly had a small, but surprisingly well equipped tissue culture lab. Then inventory... Hah. Inventory. I kinda went nuts. Now, starting out a tissue culture lab is easiest with sterile plants to start with. Sooo as is done in the industry (TC, not specifically aquatic plants), I bought them. Last count I think I was up to... 44 species already in tissue culture when. Purchased. Another 50 some odd in a 30g aquarium I bought on Facebook just for use as a holding tank for stock plants. Common things. Expensive and rare things. Everything in between. Even working with APHIS currently to get import permits to buy a bunch of plants I want from Ukraine... But that'll be a later entry. Got species in. Got my 14qt pressure cooker ready. Media logbook out. Batch 0001. Now my cooker, while large, holds a Max of 7 of the vessels I had on hand at the time. 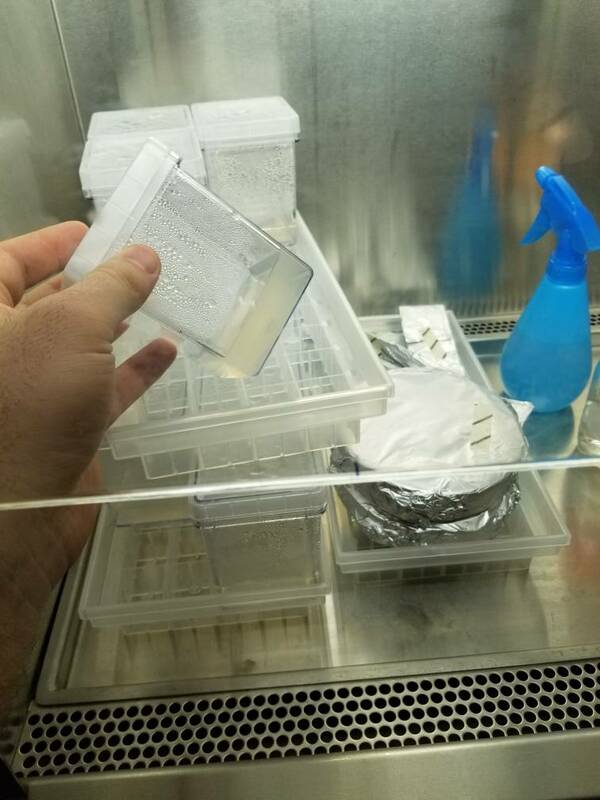 (This has as of last night been remedied, I have new containers and methods in place to be able to produce 2L, 24 of my new containers, every 40 minutes using the same equipment, so now I can really ramp things up). While the cubes were great in lab at ESF .. with an autoclave room that I could put dozens in at once to steralize... I had to find a solution for that soonish (hence the aforementioned new containers and methods I put in place), but at the time... I made it work. 1/3 of a liter at a time I steralized my culture cubes. That's 40m cycle time to heat, cook 30m, rapid vent to reload and repeat. x6L of media. 12 hours of media prep to make 6L.... But my wife helped me out once I showed her what I was doing stepwise. She was watching to learn and see what exactly I do, had never watched me in lab before, just knew of the work. So she made media when I was at my normal day job and such, when she got home from her job as a teacher. Started transferring plants from the tissue culture cups I purchased into my own media formulation this past Sunday. 5/20. I've got about half of my tc-stock in culture at this point. Dealing with poor quality purchased plants. Cups that came sealed but had still been contaminated. Cups with no media left because it leaked out into the shipping boxes, or had turned brown and nasty. Bloated and deformed cups. Crushed cups. Cups that appeared to have barely had any media in them to begin with. So what *should* have, in theory, been an easy "open, divide, close, repeat" operation became much involved. I had to wait for some of my chems to come, PPM specifically (plant preservative mixture, an autoclavable antibiotic/antimycotic) to resolve it. So it drastically slowed me. That came in on Wednesday and I've started cleaning up contaminated cultures for use. I also purchased .22um filters and luer lock syringes to use on antibiotics in future to avoid being blindsided by contamination in the future... Those arrive today. So out of the species I put in my media, 3 showed early signs of bacteria and/or fungal contamination and have been treated. This morning before I left for work at 5am, I moved one from the PPM soak into a low-agar 'liquid'ish media, supplemented with PPM and additional PGRs (plant growth regulators) that I don't use in my normal media. The other two I discovered yesterday were showing contamination so they're currently on my orbital shaker in sterile distilled water + ppm and full strength murishige salts. Tonight they go to their own liquid media with PPM to try to save em. 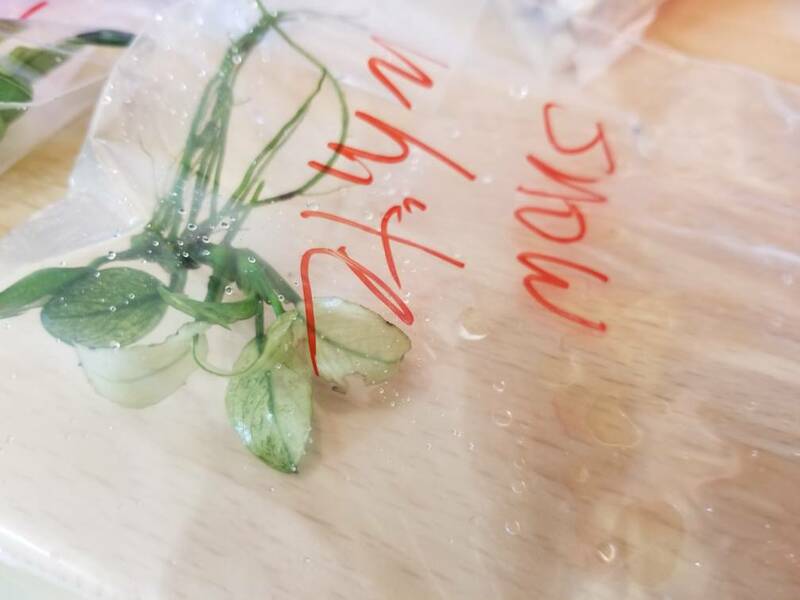 I bought Glossostigma (vendor unnamed, because they were GREAT, but it was specifically all the cups they sold from Aquatic Farmer that were in horrible, horrible condition, and I had issues with same brand from other sites too) that was super bloated. So contaminated the PP cups had deformed from gas pressure inside. I decided to also try to save them, so I treated them last night as any other explant would be treated from a non sterile source. 70% IPA, bleach wash, sterile water rinses, and a 24h PPM bath on the shaker. We'll see if they make it... Those cups we're BAD, and it's a cheap enough plant I don't mind starting over, but it'll be good practice and show me if my experimental liquid media I formulated will be sufficient when paired with my steralizing protocol (slightly modified from the steps listed in any textbook or journal article for decontamination of explants). Also hoping that the liquid media I made will function as a rescue media... My riccardia came without any media at all basically ... And when put under ~20k lumens of t5.... It scorched. 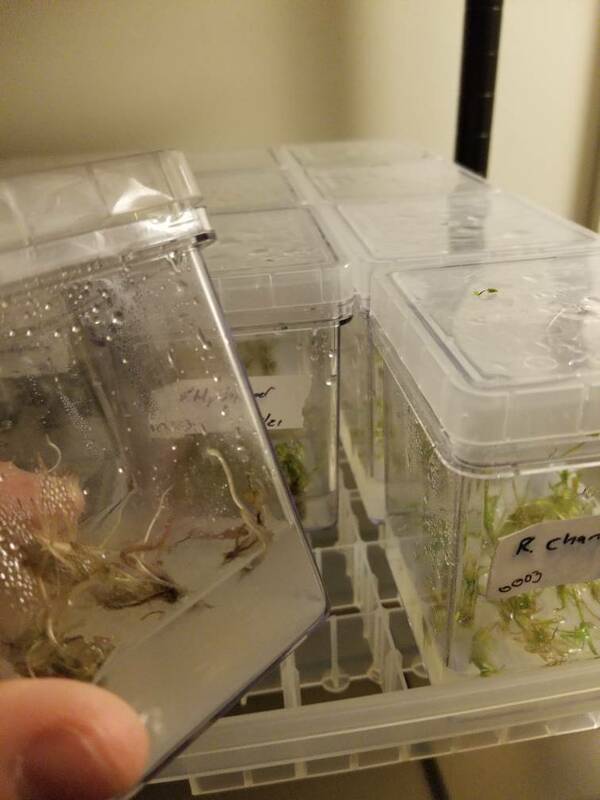 Almost everything else thrived as expected, but the riccia and a moss (Vesicularia 'creeping') got burned pretty badly because of being almost dry inside their retail containers. So the surviving green pieces of that are now on the shaker in that media too. Time will tell. I'll have my tween 20 in today, so I can begin steralizing from my stock tank. 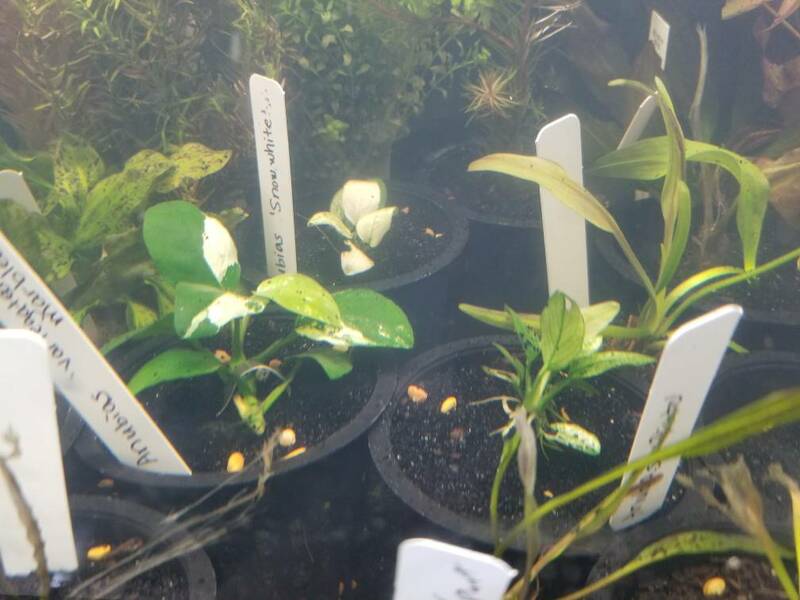 Going to start this weekend with a single explant from my iguazu 2009, Anubias snowwhite, a few Echino, and my fissidens nobilis. Hopefully steralizing protocols work, because I have a 30g tank entirely filled with plants. So full I have some floating in a breeder box, and I had to hang a moss mat on the wall of the tank hahaha. That tank is running CO² (my first tank to do so, my 35g rebuild project incorporates it but that's still in progress being built), daily fertilizer rotation of Flourish trace and Excel, Flourish Synthesis every 4d since there's no animals in it except snails, and Flourish (original) every 4d. Has fugeray2 on it. 225gph circulation pump, air bubbler, and a HOB filter designed for a 75g. all the plants are in 2" and 3" mesh cups from hydroponics store, weighted with aquarium gravel in the bottom, organic potting mix, and capped with sand (except a few plants I was lazy on that don't *need* soil, like my rotalla, and plants that rot in soil like the few neat java ferns I have in there, those are just in cups with gravel and lead weight). I need to make room ... Since I have 5 more new Buce, a few Crypts, and another java fern coming. And I am actively hunting for a list of about 30 other species that will need homes if and when I find them. Some I'm trying to source from overseas even, finding suppliers who ship here that I can get my APHIS import permits for. 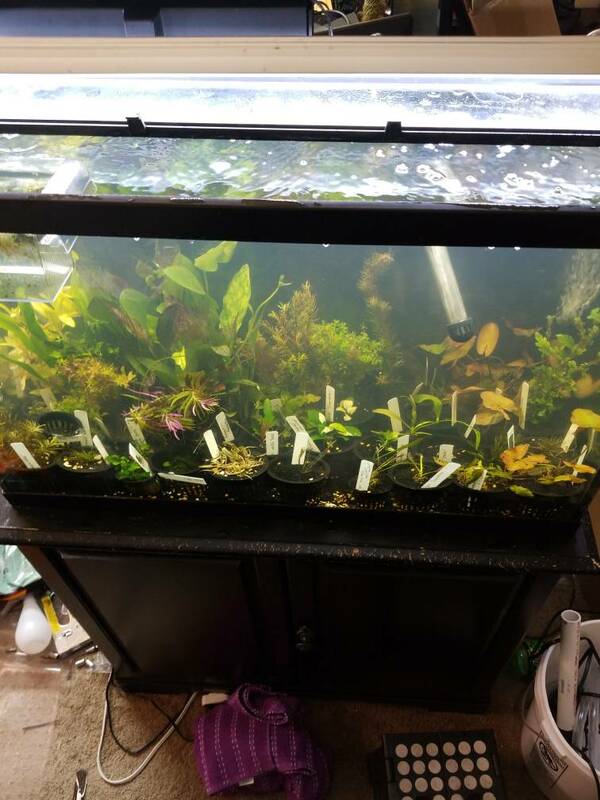 All in all, Adirondack Aquascaping is looking to launch with a catalog of over 100 species. Took about 10k from my retirement and brokerage account to make it happen, but as long as I can do it with acceptable contamination rates, and find wholesale and direct to consumer sales at a volume to move my inventory, I plan to hopefully be able to quit my job doing microscopy in a semiconductor fab by November and do this full time. It's the perfect combination of my lifelong goal of being a botanist, with my biotech degree, and my love of aquarium keeping. Itd allow me to have a small lab on my property, as my mother once did with a wedding bakery when I was a kid. Letting me always be home and be there for my wife and our kids when we have them. If I can make it work.... This one project could be the key to getting exactly what I wanted out of life. Seems like an overstatement.... But it will. Father who is home and a large part of family life. A home with lots of land. My own business. Working with plants. Its just perfect. And all because I decided to go to a 'free' seminar on aquascaping that gave me the inspiration to put all the pieces together in my head. Yes, there's a website. Parked. Nothing on it. Facebook has one picture. No updates yet. See disclaimer at start about time for blogging, that's Facebook right now too. Linkedin? Yep. Exists. Has the logo I threw together one night with a graphic I got small business licence for a few weeks back and that's it. Made that page yesterday on break at work haha. 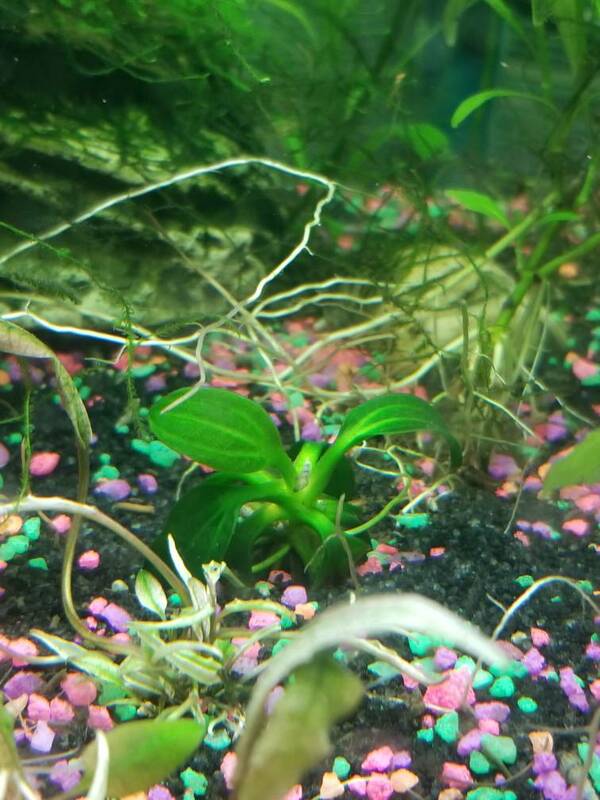 I'm very active on discord in a few planted tank and aquascaping channels, namely bc I use discord regularly for warcraft (hence my username ON discord is the same as my main character in WoW, Ehlsuh#8622). I'll do my best to respond to questions and engage in conversation on here though. I promise. Sorry for the essay. Was several posts worth of journaling but easier than reserving even more posts to make multiple entries. Which... As soon as I post I'm doing. Will also respond inline to comments and convos if anyone wants to chat or learn or ask questions. Pictures are assorted. My lab as is. Stock tank with all my current inventory. Close-up of my iguazu '09. Shots of the cultures I bought (the small round ones). The cubes with my media in them. I'll add more pictures as time goes along too. Adkaqua whats the reserved mean? Reading your journal now, looks super fantastic so far...! well written. So new big updates and such that I want to be right there at start of thread I can just edit those reserved comments, and then without scrolling through pages of comments (assuming anyone else comments in this hah) people can see the new stuff.